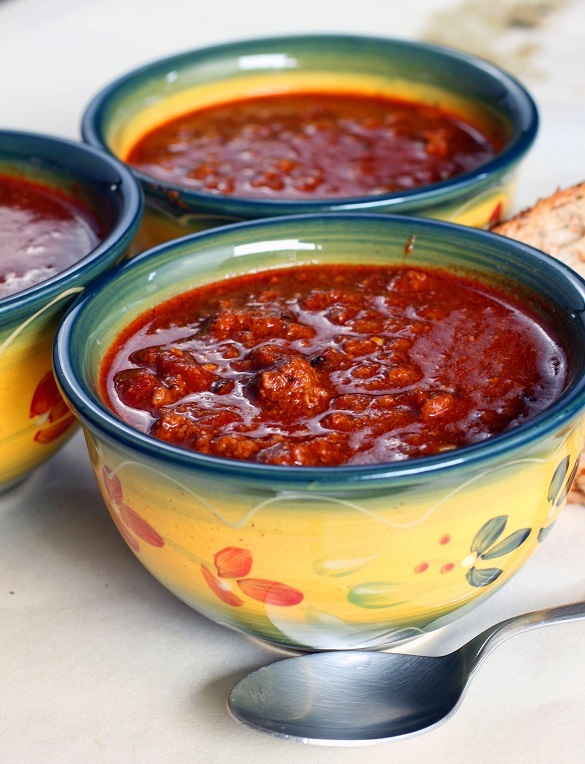 Chili is good all year round but it’s especially comforting during the chilly winter months. Pair it with some crusty bread or SYD cornbread, it makes a complete meal. You can amp the heat up or down, and the spices up or down depending on your mood. I like chili that’s plain and simple. I don’t add beans, chopped onions as a garnish, shredded cheese, nor sour cream. 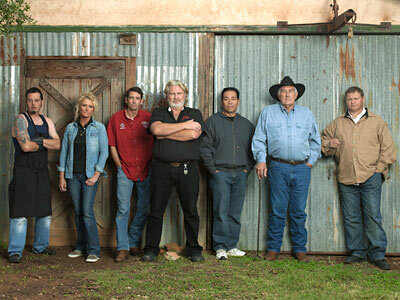 Of all the chili recipes I’ve tried, one of the best that I like is the one that Johnny Trigg made during Season One of TLC’s BBQ Pitmasters. Johnny cooked a big pot of chili with about 20 lbs of ground chuck and it was served during the dinner scene in the Season Finale episode eight. We actually ate dinner in the scene where Johnny challenged all the pitmasters to a winner-take-all rib throwdown. Paul Peterson who was also on the show was a trained chef and he made some awesome enchiladas with Pico de Gallo but it was Johnny’s chili that was memorable for me. 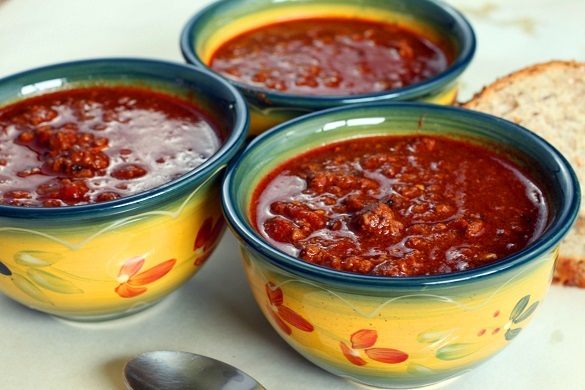 His chili is mild and very enjoyable and you can eat a lot of it without getting heartburn. When I told Trish, Johnny’s wife (all of us called her Mom on the show) that I liked Johnny’s chili, she was so kind to send me a handwritten recipe for Johnny’s Texas style chili with no beans. I’ve since adapted Johnny’s recipe to suit my tastes and cooking style. For example, I like to smoke my chili in a cast iron pot on the pit to give it a smoky flair and I make it much spicier. I also use the spice dunk approach (see recipe) that is common among competition chili cooks to get maximum flavor before eating. I also add a piece of old cheese to enhance the flavor and give it a smooth luxurious texture. It’s thick and can be eaten with a fork and goes well on top of a hotdog! I like to make it the day before to let it rest in the fridge for at least a day before I reheat and serve it. Saute ground beef in large saucepan in canola oil until beef is cooked. Season with SYD Hot Rub to taste. Use a slotted spoon to transfer the cooked beef into your cast iron pot. If you don’t have a cast iron pot, you can use a disposable foil pan for easier cleanup. Or use a pot if you’re cooking the chili on your stove. Drain off excess fat leaving behind about 4 tablespoons of fat. Add onions and sauté until onions are translucent. Add chopped garlic and cook for a couple more minutes. Use a slotted spoon to transfer the onion and garlic mixture to the pot or pan where you have your cooked ground beef. 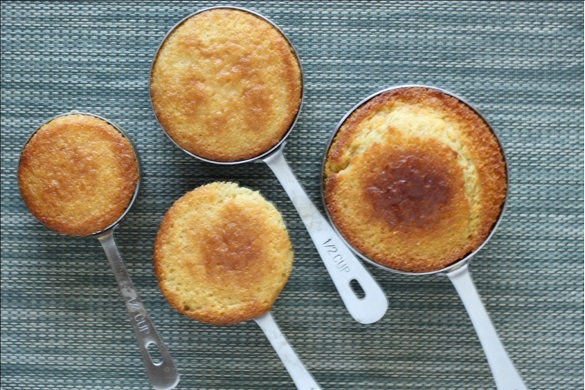 Whisk in two tablespoons of flour in the remaining fat in the saucepan. Cook the flour in the oil under medium-low heat to make a roux. Add more oil as needed to get the right consistency for the roux. It should feel like uncooked pancake batter. Cook the roux until it is light brown. Once roux is light brown, turn up the heat and add water a half cup at a time to whisk the roux into gravy. Once you reach the gravy consistency, stop adding more water. Add the canned tomatoes, tomato paste, block of old cheese, brown sugar, cinnamon, crumbled beef bouillon cubes, cayenne, and salt and pepper. Pour the entire mixture into the pot/pan you have your cooked ground beef. If you’re not going to smoke the chili on the pit, you can use a pot or Crockpot to simmer the chili for several hours. Add half of the spice dunk mixture and mix thoroughly. Put the pot/pan into your pit at 250-300 degrees and smoke the chili uncovered for several hours. Every hour, give it a stir and add more water (or beer) as needed. Add the remaining half of the spice dunk mixture about 15 minutes before you’re going to eat it. The extra time is needed to cook the spices. There is a fine line as to whether the spices taste “raw” or mellow and it’s a matter of individual preferences. Some people like the taste of the raw spices and some don’t. For chili competitors, this is a topic of endless debate. For me, 15 minutes is just right. I also prefer to cook my chili and then refrigerate it so I can eat it the next day as it tastes better. 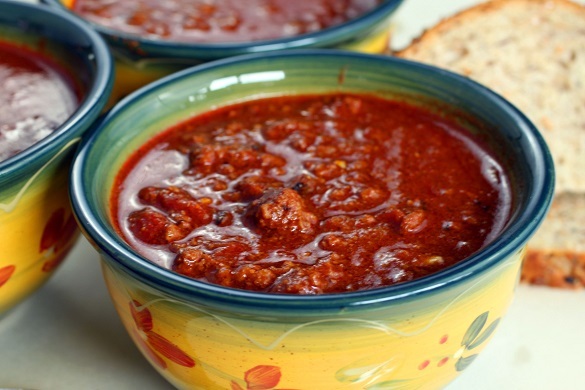 Before you serve your chili, don’t forget to taste it before serving as the spices have mellowed out. Don’t hesitate to add more spice dunk, cayenne, salt, pepper, and brown sugar to your liking. I like to eat my chili with some freshly made SYD cornbread. Enjoy! Looks like a nice recipe. You may have read the recipe incorrectly. Additions of spices are known as "dumps" not "dunks". Good luck in 2013! know dumps is right, but I like dunks. I’ve got a batch of this chili on the smoker right now. We’ll see how it turns out. Yes, it’s March Madness and for someone who loves basketball and barbecue, what’s a few "dunks" among friends! I’m new to this site. Is there a "print" button for the chili recipe hidden somewhere or do I have to write it out by hand? My "print" and "print screen" buttons get me a blank page out of my printer….Thanks! The recipe seems a little complex for a simple chili. I can’t see Trigg pronouncing half the words used. Must be heavily modified. Yes, the recipe is complex and the results are worth it. The addition of old cheese, roux, and SYD Rub were mine as I wanted more thickness. The "dunks" are also mine as I enjoy chili that has a robust flavor. What type of wood do you use for this chili recipe? Thanks for sharing! I like apple wood as it has a light and fruity smoke flavor. This is amazing! Recently purchased a smoker – couldn’t wait to try chili. Will never need another chili recipe ever again. Thanks! I’d like to cook this the day before, and then heat it up 2nd day in a crockpot for a chili competition at work. Should I put the 2nd dunk day 1, or wait until I’m almost done heating it up in the crockpot? Yes, when a day later, dunk a fresh set of spice mix before serving . Stir and add liquid as neesed to adjust how thick you want your chili. I like mine where a plastic fork will stay upright in my chili. I made this for my husbands work today for the chili cookoff! Awesome flavors. I didn’t have the spice dunk though and added an horchata beer. Guess who won 1st place!! Any recommendations on type of beer to use? Gonna make this later today. Do you throw that block of cheese in whole? What effect does that have? Why not cube it or shred it? a block may be hard to dissolve so you can cube or shred it also. 5 lbs beef?? Feeds 6?? Is that right?? Must be TEXAS sized portions….mme bad. Is it 1 lbs? This recipe sounds great. I’m going to give it a try. Thanks! So is it really 5 lbs of beef? You are very welcome. Venison is delish amd very lean. Sure you can but real chili is usually beef cut into 1/4 inch dice for the purists. Is 5 lbs of ground beef correct for 6 servings of chili? Ok, I’m new to this…. but what is a spice dunk? I have no clue what this is or how to put it in the chilli. Also I need a alternative spice for this chilli as I will not have the spice you are suggesting. Thank you for the time!! And I can’t wait to sweep the competition at my chilli cook off. In your contest, add some dunk about 10 minutes before turn-in to get the flavors to pop. Simmer and adjust the amount to not overdo it. Good luck! In January 2018, this recipe was used by me to win the 2018 Kiwanis Chili Cookoff in Alameda California using 3/8 inch dice Prime tri tip purchased from Costco in Pleasanton, Calif. This recipe rocks and there’s a medal to prove it. For the competition did you use both ground Chuck and tri tip? Also, did you smoke the tri tip first? I use tri tip for ICS-style chili contests. For home and backyard cooking, regular chuck is fine. What is chili spice dunk if it is just a mxiture of spice you make up what do you recommend to use? Harry…back to the use of Tri-Tip. Did you smoke the Tri-Tip before adding it to the chili or did you cook the Tri-Tip with the chili? Yep, made the perfect chili. I have loved this recipie for a few years now. This year I added a twist. I cook the ground beef OTT style. I use a serloin as well and use bacon fat for the oil. Cooking my second batch this season. 1st batch was hands down the best chili I have ever made or had for that matter. Just tried this recipe for a church chili contest and it won out of about 25 other pots of chili. So chalk another win for this recipe. I smoked it for about 6 hours with hickory flavor. Best chili I’ve ever had! Congrats! Another winner! When you have time, you can watch my Youtube channel where I won the Kiwanis chili contest with a similar recipe. No beans in this recipe?